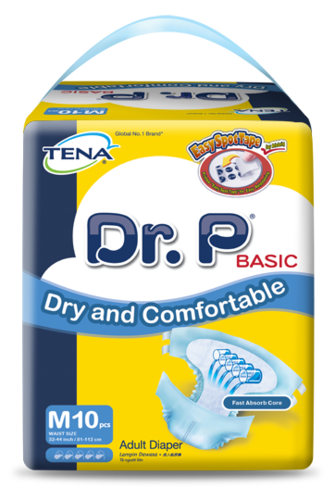 Dr. P by TENA keeping you dry and comfortable with High Speed “O” Channels and Fast Absorbing Pad. High speed “O” chape channels designed to quickly and evenly distribute urine throughout the pad. Fast absorbing pad helps urine drawn and securely locked in for a dry and comfortable feel. Easy spot tape allows adjustment at any area to achieve a perfect fit.